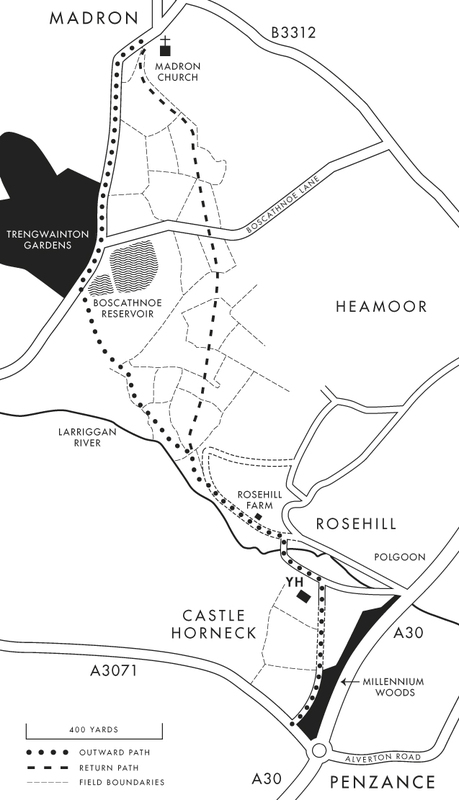 Via Castle Horneck, Rosehill, Boscathnoe and Trengwainton. 30 minutes there / 30 minutes back (non-stop at a steady pace). Easy (but muddy when wet – Wellington or walking boots essential). First, make your way from Penzance town up Alverton Road to the A30. At the roundabout take the St. Just turning (A3071), and then take the first lane off on the right. This is the start of the walk. 1. Follow this lane past Millennium Woods on your right (feel free to explore the woods, but be aware of disused mine shafts). 2. Cross the field that is currently abloom with daffodils. Note the enormous monkey puzzle tree ahead of you. 3. You'll reach a small road, when you'll notice the Castle Horneck Youth Hostel on your left. 4. Turn left and continue up until the white gate, and take the narrow path to the right that leads down to the Larriggan river and Rosehill. 5. Cross the bridge and continue uphill. Here, you'll hit the narrow road leading to Rosehill Farm. 6. Turn left through the farm. Rosehill is a working farm so please keep to the path. 7. Continue past the house and barn and go through the wide gate at the end. 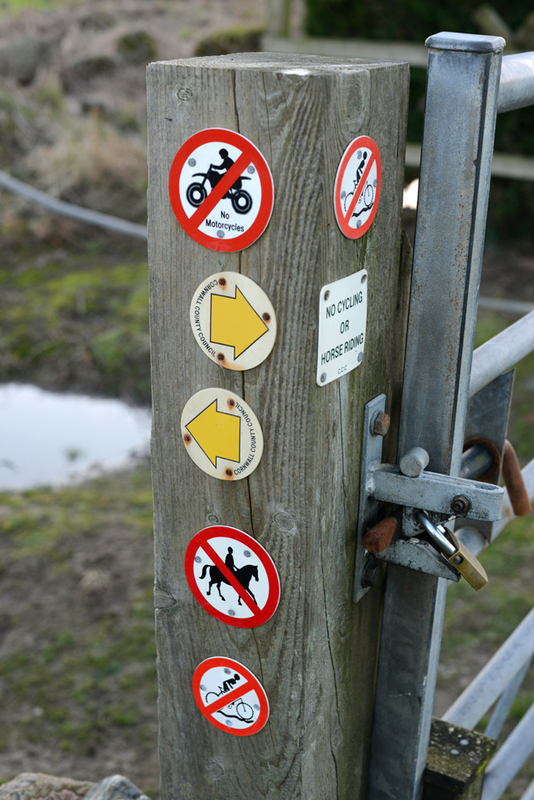 Remember to close the gate and keep dogs on a lead as there are sheep in the field ahead. 8. Take the farm track uphill, but keep your eyes peeled for a break in the hedge on your left, about half way up the track. 9. Duck through the hedge and continue forward through the field. 10. In the top right-hand corner of the field you'll see another gap in the gorse hedge. It looks a bit like an oversized rabbit burrow. 11. 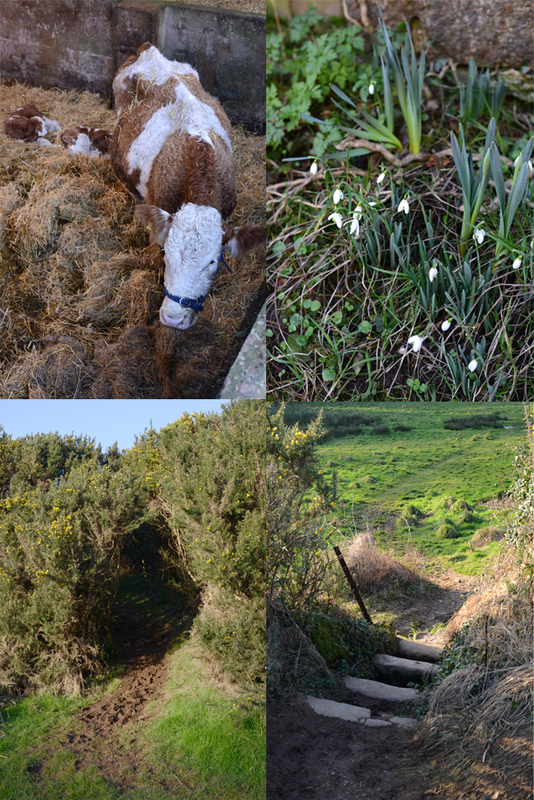 Enter and wind your way through the undergrowth until you find the stile. Now you'll see the way ahead is clear over the fields. 12. Keep to the left-hand track across the fields. 13. This track will eventually join a path that runs alongside a small wood next to Boscathnoe Reservoir. 14. This path will take you up to the main road. Take a moment to climb through the gap in the wall on the right to find a clear view of the reservoir. 15. Back at the road, turn right. Over the hedge on the right you'll see the mangrove swamp-like trees in the water, and over the hedge on the left you'll glimpse the tree ferns of Trengwainton Gardens. 16. When you reach the junction, bear left along the road signposted 'Madron 1/2 mile'. You'll pass the entrance of Trengwainton Gardens and the lodge buildings on the left. The Gardens are open from 17th February until 3rd November this year and closed on Fridays and Saturdays. 17. This road carries on up the hill and will bring you to Madron. 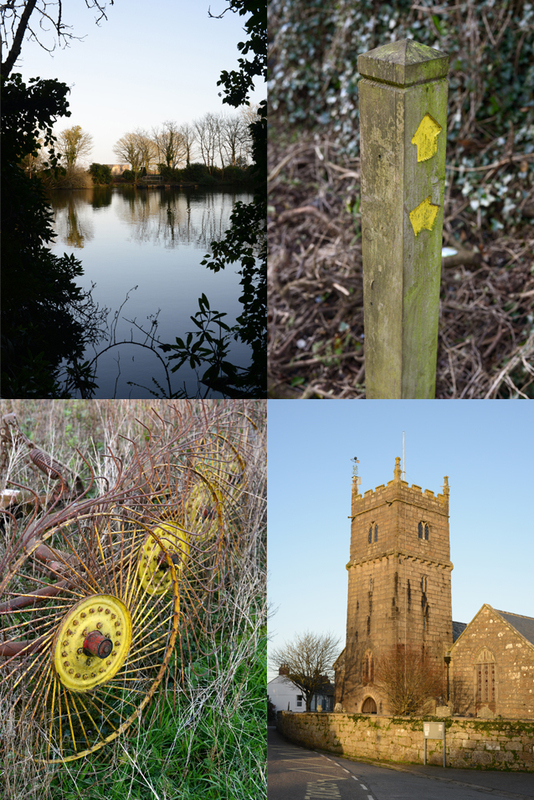 Once there, take your time to explore the village; the lovely old buildings, the 14th Century church, and ancient wishing well. The sign on the pub door promises us that it will be reopening in Spring 2013. 18. For the return journey take the clearly signposted lane to the right of the church. 19. This lane turns into a field – stick to the left and follow the hedge down, go over the stile and through into the next field, which you go straight across, and then cross the following field too. 20. Now you'll hit Boscathnoe Lane. Cross the road and pass through Luthergwearne Farm. 21. Follow the track across a further four fields until you reach the stile you crossed at point 10. And the rest is history, in reverse of course. As no walk is complete without a rewarding pint, when you get back to the A30, why not wander down Alverton Road and drop into The Pirate Inn. What a terrific post - thank you. I look forward to reading about other walks you have discovered. I love walking and hiking around Penzance and West Penwith - it makes me realise how lucky I am to live in such a special place.